Ahh, the joys of iced tea. Even in the depths of winter, sipping a tall glass of sweet iced tea calls to mind lazing around on the porch under a warm midsummer sun. What’s more, it’s even good for you! While there are some good bottled iced teas on the market with natural ingredients, making your own at home offers many advantages: less packaging waste, guarantee of no artificial ingredients or HFCS, unbeatable freshness, and complete customization for your taste preference perfection. If you’ve been inspired, as I have, to green your beverages by making your own coffee and even soda pop at home, then here are some tips on making your own sweet iced tea. After all, we’ve just survived February, we’ve earned a look ahead into summer! Tea: Teabags are easier than loose tea, but tea leaves in a teaball or muslin can be more economical. Use between 2 and 6 teabags (or equivalent loose tea) per batch (one batch is typically 2 liters/quarts, or 8 cups of water). Steeping time suggestions range from 10 minutes to an hour. Traditional iced tea is made with straight black tea, but experiment with green tea, white tea, flavoured teas such as English Breakfast or Earl Grey, and herbal teas. Sweetener: White sugar is the most common choice for sweetener and can range from 1/2 cup to 2 cups per batch, depending on taste preference, strength of tea and whether other ingredients such as lemon juice have been added. Try substituting with an equal amount of honey, or use other natural sweeteners such as agave or stevia. Additional Flavours: The classic iced tea enhancer is lemon juice — fresh-squeezed if you can! Try between 1/4 and 1 cup, and remember to adjust the sweetener if needed. Other fruit juices such as mango, lime, orange, cranberry or blueberry are also great additions. Finally, experiment with fresh herbs like mint, fennel, even basil! If using herbs, add to the water along with the teabags when steeping. Stovetop: All the water is boiled in a pot on a stove. Teabags are added to this boiled water and the whole thing is left to steep. 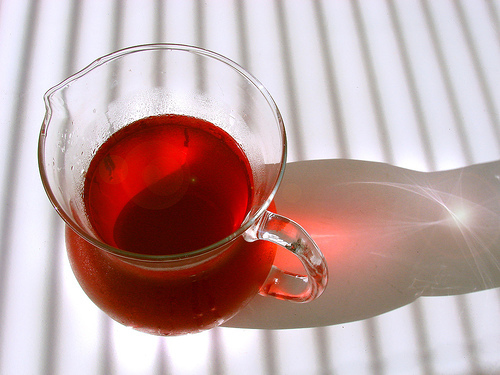 Sweetener may be added on the stove or after steeping, and additional flavours are added after steeping. Pour into a glass pitcher and chill in the refrigerator. Concentrated Quick Cool: Only some of the water is boiled (for instance, 2 cups for a typical 2-quart/liter batch) either on the stove or in a kettle. The boiling water is poured into your glass pitcher along with the teabags to steep. The sweetener is then stirred into the hot, concentrated tea, and the remaining quantity of water is added cold. This needs less chilling time before it’s ready to drink. Sun Tea: The pitcher of water and teabags is set out in the hot sun to steep by solar power. This is the most “natural” and energy-efficient method, but it does have to steep much longer and there are potentials issues with bacterial growth since the temperature does not get high enough to kill any bugs that may be present. Warm your pitcher with a swish of hot water before adding the hot water to prevent thermal cracking. Looking for yet another use for that super-useful baking soda? Try sprinkling just a pinch into your pitcher before adding the tea. This reduces the acidity and sharp bitterness of the tea, making for a super-smooth result. Cover the tea while steeping. Squeeze teabags against the side of the pitcher when removing to get every last delicious drop. Try reusing your teabags too — a second steeping might take longer, but often works quite well. Arguably the healthiest iced tea would be made with green tea, honey, and lemon juice. Each ingredient has powerful health-promoting properties. My favourite recipe right now: I use the Concentrated Quick Cool method with 6 teabags (Ridgways Organic Black) steeping for 15 minutes, 3/4 cup of sugar, and 1/4 cup of lemon juice. I’m experimenting with other combinations, for instance, I reduced the tea to 4 bags and the sugar to 1/2 cup, but found it too weak for my preference. Next time I’ll try steeping for longer to compensate. While water is truly the only drink we actually need, when you crave some flavour iced tea is a great, healthy beverage option for the whole family. My 10-year-old son, who doesn’t even like soda pop, would drink iced tea all day if we let him. Comment and share your favourite recipe! I enjoy iced tea as well and do almost everything you recommend above. The one exception is that instead of brewing the entire pitcher’s worth of tea, I make a very concentrated batch. . .like use all the tea bags you’d use for a pitcher, but put it in only 1 or 2 cups of boiled water. Then I add ice cold water, and some ice, to that so it’s instantly ready and I don’t have to wait for it to cool down. Besides adding slices of lemon, slices of other citrus fruits like orange are also equally good and very pretty when poured into a glass. Sometimes I even add frozen berries, like strawberries or blueberries. Hi 1001 petals, that’s actually the second method I describe in the article and is the one I use myself, as I mention in the last tip. I like your idea of adding frozen berries! What a beautiful presentation for visiting dinner guests, for instance. Many health food and vitamin stores carry this product, but it’s amazing how many people don’t know about it yet. It’s popularity is growing though. I encourge everyone to look for it. God provided us a plant that grows in Paraguay and SweetLeaf knows how to use it!! Sorry, but your comment does come across sounding like spam advertising, like you glanced at the article to get the basic content but didn’t actually read it, or else you’d have noticed that stevia was already mentioned. Stevia is an herb, not a “product”. And this beautiful and delicious plant grows not only in Paraguay, it’s growing in my garden in Ohio. There is no sense in buying a watered down “product” made out of something that you can plant once and, because it is perennial, enjoy forever. And, because the leaves are super-super sweet (20-30 times sweeter than sugar cane), when in season, just throw a couple leaves in with the tea bags and YUMMM. The leaves can also be harvested, dried, crushed to powder and used in place of sugar (though will be about 10 times sweeter than processed, refined sugar) the rest of the year. And using the actual plant instead of the “product” is 100 times ‘greener’ and makes life so very sweet!